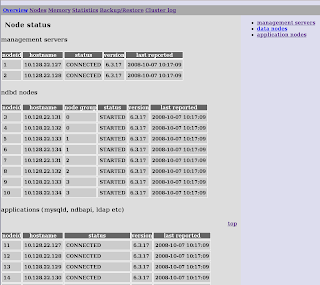 Tweet Is it possible to upgrade from MySQL Cluster 6.2 to MySQL Cluster 6.3? Of course! Can it be done online? Sure! Install the new version (please note that you have not restarted anything yet - we are about too). The install phase is just to copy out the binaries of the new version to all hosts and make sure that you are referencing the new version of the Cluster binaries in scripts, PATHs etc. restart both (all) management servers at the same time! For the management server on host A: ndb_mgmd -c "A"
For the management server on host B: ndb_mgmd -c "B"
And NOT ndb_mgmd -c "A;B" , then you risk that they pick up the wrong configuration data (unless you stop them both at the same time and then restart them) and it would be really bad! restart the mysql servers (one at a time) until you have restarted all of them. Actually, for a short period of time, the web browser will show a blank page for the duration when the management servers are stopped and restarting! sh ./rolling-restart.sh (sh ./rolling-restart-monit.sh if you are using monit to guard your processes). I used the approach above together with cmon. Another very useful post on your blog. I've just performed an upgrade on our custer from 6.2.15 to 6.3.18 with the help of your configurator tool and your blog. I've tried to setup cmon as well as it looks quite handy but I'm running into a few problems with it. Oct 13 17:11:52 web1 cmon: Table 'backup' did not exist. Schema incomplete. Going to recreate missing tables. No tables are created and at this point cmon seams to exit. and let me know what you get for the above. Please email me at johan at severalnines.com or go to launchpad.net/cmon and report the bug there. configure: error: Couldn't find NdbApi.h! checking for ndbapi headers... configure: error: Couldn't find NdbApi.h! Can you do a uname -a and email me the details. Also email the output from mysql_config. from the shell should say if it exists or nor. However, the error message is bad..
Can you let me know what happens! So I don't get what's wrong ? Again - my system is CentOs 5. Firstly, looks great - I realy want to get it running! (setting the CPPFLAGS is not needed as is wrongly used). Let me know one way or another what you get from the above. vim /etc/httpd/conf/httpd.conf # and change DocumentRoot to: DocumentRoot "yourdirectory"
change $mysql_hostname="localhost" to $mysql_hostname = ":/tmp/mysql.sock"
any ideas? there's a binary precompiled out there?